Every issue of a subscription to Warships International Fleet Review magazine has been edited by a former defense reporter of a national newspaper and assisted by a top team of reporters. War Ships International Fleet Review magazine spotlights the latest developments in the world's navies covering current defense issues with expert commentary by leading analysts. Every issue of a subscription to Warships International Fleet Review magazines provides news from foreign armed forces including in-depth profiles on various navies around the globe, features on the latest national and international maritime events illustrated by informative (often exclusive) colour and black and white photographs, up-to-date reports on recent defense procurements and world-wide naval design and technology developments. As well as all this, a subscription to Warships International Fleet Review magazine also brings regular articles on naval heritage plus book and video reviews, all delivered straight to your door every month. 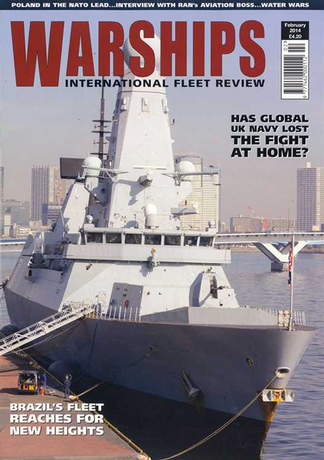 Don’t hesitate, invest in a subscription to Warships International Fleet Review magazine today! Be the first person to tell us what you think about Warships International Fleet Review and you'll save £2.50 on your next purchase!